Scientists today still cannot produce evidence demonstrating that large-scale evolution is even possible. Now some readers may already be thinking—hold on, scientists observe evolution taking place. True, we see small evolutionary changes in animals that have adapted to their environment. But you will find those changes always produce the same—or a similar—type of organism. It may have a slightly different shape or color. It may possess some relatively minor biochemical differences. It may even be classed as a different species—but it is still the same type of organism. Scientists now understand these changes come about either as a result of mutations altering the DNA of the organism or parts of the DNA code being switched on or off. DNA is a very large molecule that encodes the processes necessary for an organism to live and reproduce. If parts of that code are altered, this can cause structural changes—which, incidentally, are almost always harmful. Many evolutionists believe that given a long enough time, such small changes can eventually result in the evolution of vastly different organisms with new and different body parts, thus constituting a new “order” of animals or plants. But despite the claims of many nature documentaries and science texts, this type of evolution on any large scale has never been observed. It is true that relatively small beneficial single-gene mutations (i.e., affecting DNA that encodes a single trait) can sometimes occur. An example of this is seen in microorganisms that by random mutations developed the enzyme nylonase. (This allows them to digest nylon as a food source.) However, nylonase is a relatively simple protein, which does not even compare with the amount or extent of massive DNA changes needed for a fish to evolve into an amphibian—or any analogous major changes in organisms. It is not merely a matter of having enough time for many small changes to accumulate. Even the smallest steps would require such huge genetic changes that many honest scientists have concluded it is so improbable as to be essentially impossible—and this is their assessment when it comes to the smallest steps! Furthermore, DNA has inbuilt repair functions designed to limit major mutations. DNA is actually designed to prevent the evolution of a new type of organism. When we consider the amazing diversity of species living today—we have discovered about two million species in existence—with an estimated 100 million to 200 million different types of species living in the past, each with its own unique DNA code, we have to ask ourselves a question: “What is the origin of all the complex DNA code which produces the incredibly complex creatures and functioning ecosystems that we see around us?” There is absolutely no evidence that random mutations can produce complex advanced information that can result in the high performance wing systems of insects and birds, the reproductive systems of mammals, and the sonar systems of bats and whales—let alone the human mind. Finally, current evidence indicates it is impossible for life to start by itself. Textbooks sometimes refer to this as abiogenesis or the chemical evolution of life. The first living cell would require hundreds of different types of very large molecules, including the genetic code compounds (RNA and/or DNA) to form by themselves. These molecules are difficult if not impossible to synthesize in the laboratory let alone form naturally—and most are relatively unstable, readily breaking down into smaller inactive compounds. Moreover, millions of copies of some of these molecules would be necessary to provide concentrations sufficient to make hundreds of biochemical reactions go in just the right direction at just the right rate—in order to have life. Mathematical modeling indicates this is absolutely impossible to happen by chance alone. In fact, if we take a live single-cell E. coli bacteria and make a small hole in its outer membrane, its chemical reactions are so disrupted that the cell will die. Furthermore, no human can make it come back to life. All the chemical components are still there, but we cannot restart the hundreds of chemical reactions simultaneously in just the right state of disequilibrium—the requirement for life. When we consider the scientific knowledge we have about life on earth, we can say with certainty that evolution alone as an explanation for the diversity of life on our planet is totally impossible. Instead, science reveals evidence of an awesome intelligent designer operating at least on some level. Why not consider what the Holy Bible claims?—a loving Creator God formed our world, but an enemy, called Satan, has been seeking to obliterate the evidence of His creative acts. The Bible does not stop there. Not only did God plan for your existence, the Bible’s last book, Revelation, claims He has a plan for a recreated earth with everlasting happiness for you. 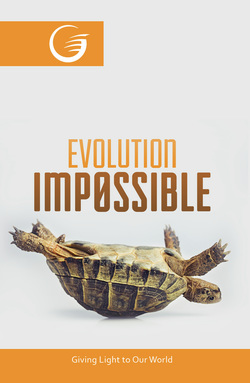 *For more information about the scientific studies showing that life on Earth did not evolve, see Evolution Impossible: 12 Reasons Why Evolution Cannot Explain the Origin of Life on Earth by John F. Ashton PhD, Master Books, Green Forest, 2012.